EAA’s immaculate 1929 Ford Tri-Motor and its “sister” from the Kalamazoo Air Zoo are touring this fall. Offering an opportunity for passengers to experience flight aboard the world’s first mass-produced airliner. During EAA’s Ford Tri-Motor Tour, passengers will travel back to the early days of what was considered luxurious commercial air travel. The Ford Tri-Motor or the “Tin Goose” was first built by the Ford Motor Company in the late 1920s. EAA’s Ford Tri-Motor was constructed in 1929 and has an intriguing history, with roles ranging from service as Cuban airliner to extensive back¬ground fighting forest fires while transporting smoke jumpers. Since then it has been hangared at the EAA Museum’s historic Pioneer Airport and only departs to make public appearances and for its touring. Both Tri-Motors can carry up to ten passengers at a time, and every seat has a window. Passengers are encouraged to bring a camera to record and share this experience. Tickets purchased in advance are $70 for adults; walk up tickets are $75 and $50 for children 17 years old and under. 2013 fall tours began the end of August and run through November 2013, encompassing 15 different states. 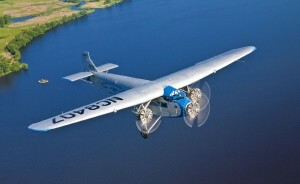 Book your spot on the historic “Tin Goose” through a secure flight- reservation system at www.flytheford.org, EAA’s Tri-Motor tour website. You can also pre-book a flight by calling 1-800-843-3612. Fall Schedule: Or you can link it to Book your flight today! Oct. 17 – 2-5 p.m.
Oct. 18-20 – 9 a.m. to 5 p.m.
Oct. 24 – 2-5 p.m.
Oct. 25-27 – 9 a.m. to 5 p.m.
Oct. 31 – 2-5 p.m.
Nov. 1-3 – 9 a.m. to 5 p.m.
Nov. 7 – 2-5 p.m.
Nov. 8-10 – 9 a.m. to 5 p.m.
Nov. 14 – 2-5 p.m.
Nov. 15-17 – 9 a.m. to 5 p.m.